 A we-have-met-the-enemy-and-he-is-us tract that, for all its evenhanded approach to an obvious dilemma, appears as likely to attract bipartisan opprobrium as to spark a debate on the overburdened state of the union. Drawing mainly on anecdotal evidence gathered in or around his Washington, D.C., base, Rauch (Kindly Inquisitors, 1993, etc.) 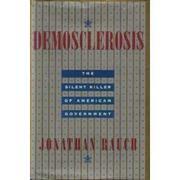 asserts that demosclerosis is ``the most serious single challenge to the long-term vitality of democratic government.'' In his unsparing lexicon, he defines this condition as the progressive paralysis of the domestic body politic (manifested in an inability to solve new problems, experiment, or even adapt to socioeconomic change). Fiscal arteries clog owing to the successful claims varied interest groups (able to enforce their will with votes and financial support) make upon the US Treasury for benefits or subsidies, most notably, perhaps, tax breaks. While the author does not quarrel with the notion of a federal government responsive to the electorate's needs as well as wishes, he deplores the havoc wrought by trade organizations and single-issue constituencies that have prevailed on the government to transfer or redistribute resources according to the dictates of special-purpose agendas. An equal-opportunity critic, Rauch cites cases in point, ranging from business associations (convinced their industries are pillars of the republic) through advocates of arguably worthy causes, e.g., campaign reform, the elderly, environmental protection, family farms, and even homeless veterans (whose coalition has an annual operating budget that tops $500,000). From an economic standpoint, he cautions, retaining lobbyists to tap the public till is no more productive (albeit no less lucrative) than hiring thieves to steal cars. Conceding the proliferation of entitlement programs is probably not fatal, the author nonetheless offers a full measure of containment proposals. His eventual conclusion: demosclerosis is a systemic disorder that, at best, can be managed, not cured. A savvy reckoning of the cost of the zero-sum games the American people play.